In THE BATTLE OF ALGIERS (playing in Washington this week), the French colonel in charge of the anti-terrorism unit is read a Jean-Paul Sartre quote denouncing French rule in Algeria. In response, he asks aloud: “why are all the Sartres on the other side?” When seeing movies made by conservatives and/or Christians, I often have that feeling myself. 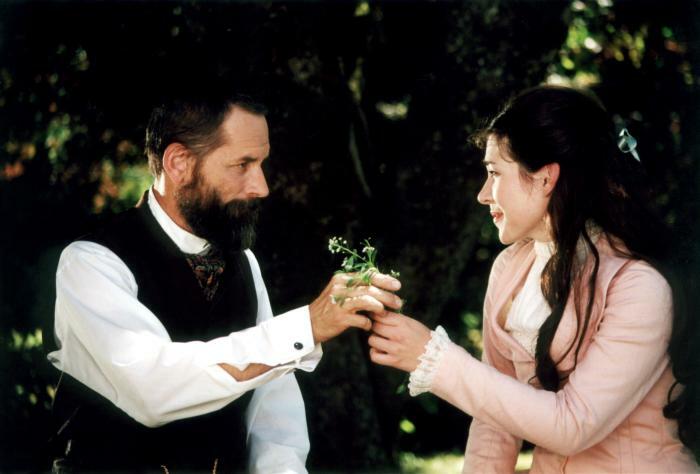 CELSIUS 41.11 and THERESE are both movies whose goals, electing George Bush and spreading Catholicism, I share. But Flannery O’Connor once said that Christian artists should be concerned more with saving their work than saving the world. That dictum applies to more than religion, and to critics as well as artists. So it’d be patronizing and special pleading for me, who often winces as liberal reviewers give easy passes to weak films with left-wing agendas, not to note the truth — neither of these films works well, even on persuasive/propaganda terms, because neither is good cinema. Ironically, some of the main reasons I did not see Michael Moore’s Movie That Shall Not Be Named are also among the reasons I don’t think all that much of CELSIUS 41.11 (subtitle: “The Temperature at Which the Brain Begins to Die”). The word on Moore’s MTSNBN was that the film was an entirely intellectual experience about the war, and that Moore was not doing his Befuddled Everyjournalist comedy act. I read this almost uniformly in the *favorable* reviews, and never read anything explicitly to the contrary. And I said in someone else’s comment field recently that I would have seen MTSNBN if anyone whose opinion I respect had said (a) the film is as funny as ROGER & ME (a great film in my opinion and that of a few other GOPers of my acquaintance); or (b) the film has the formal chops of an Errol Morris or a Dziga-Vertov or a Leni Riefenstahl (sticking to documentarians). Unfortunately, neither of those stipulations holds for CELSIUS 41.11 either. I happily gave my $9 simply as a statement — plus a conservative friend asked me to see CELSIUS with him. But cinematic excellence is the summum bonum on this site, and this film just does not measure up. There was not even an attempt at levity or humor, except a couple of jokes from the talking heads that dominate this film (one of whom, full disclosure, is my work colleague Bill Sammon). CELSIUS is a pure polemic — a 75-minute infomercial for Bush. It’s structured around five myths — that Bush stole the Florida election, that there was no WMD threat from Iraq, that Bush is making the Islamofascists hate us, etc. — and proceeds to rebut each. The best moments were the liberal demonstrators — the “I love New York more without the WTC” signs, saying they like dictators who have national health insurance, the Democrat lawmakers saying how Saddam Hussein and his WMDs were an awful threat, and other Moore-like “use their own words against them” moments. And it effectively showed that John Kerry is still living on September 10 — promising only to strike terrorists after they do and seeing this all as a legal problem. And it uses Kerry’s testimony before the Senate in 1971 to hang him high. But CELSIUS is not careful at times. 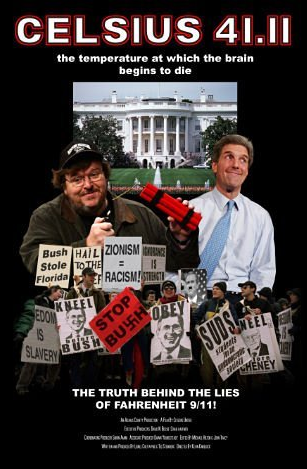 As if in rebuttal to Moore’s notorious scroll of US foreign policy actions in BOWLING FOR COLUMBINE (tendentiously set to Louis Armstrong’s “Wonderful World”), the film provides a list of attacks on the United States and the liberal democracies of Christendom by Muslim terrorists since 1979 and Iran’s unpunished invasion of the United States. The point is clearly made — anyone who thinks the Muslims (or The Perfidious French for that matter) hate us because of Bush is smoking crack. But the dates and places flash by so fast that we have no time to absorb them. And the fact I noticed one item — the crash of an Egypt Air flight — that gave me a start, wondering why it was there at all, that it made me not trust the scroll. It had become as glib as Moore’s scroll since we have no time to absorb it. If this had been a segment on “POV” (as if PBS would have it), CELSIUS would have quite effective, but it’s basically a quick TV show. Showing it in a theater makes it look terrible and out-of-its-depth, like putting a promising high-school player in the NFL. 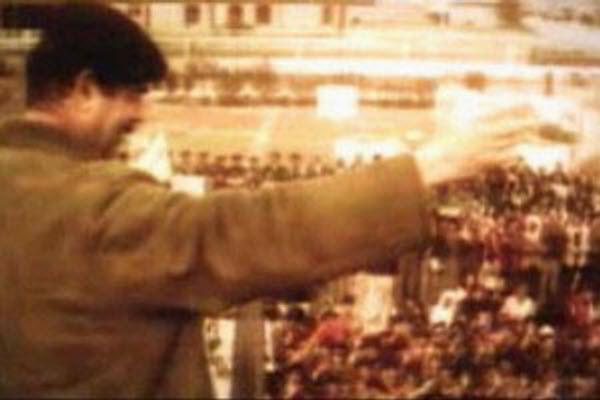 The film seems to have been shot on broadcast-quality video, which is fine on TV, but is painful to look at when blown up in a theater screen (plus it creates framing problems). Also, the found footage of liberal insanities was amateur video to begin with, so you have the “second-generation copy” problem compounding the visual awfulness. In addition, much of the film is closeup of talking heads, which gets to be visually oppressive when kept up for as long as CELSIUS does it. CELSIUS is an intellectually effective rebuttal to some of the liberals’ favorite canards. But even apart from the limitations of its preaching to the choir premise the overscored closing montage had me in diabetic shock), it just doesn’t belong in a movie theater. With THERESE, we have a quite different problem. Clearly, the people involved tried to make an A-list movie. But their reach far exceeded their grasp. THERESE comes up so short in the basic cinematic ABCs that a rational world would consider the fact that THERESE is a biography of a great saint (based on her own memoir) a matter to hold against it — “St. Therese of Lisieux deserves better,” basically. And as a movie, THERESE is simply terrible — badly shot, badly lit, badly scored, often badly acted, and often badly written. At the most basic level — what you look at on the screen — THERESE has some of the worst cinematography I’ve ever seen. The frame often cuts characters off at the head (and I don’t believe this was a framing issue at the theater, since the lead review at the IMDb noted the same problem. The film also looks seriously underlit, with the colors mostly washed-out and the images so grainy that it looked a cheap 16mm blowup from Fotomat. The two most important closeups in THERESE — her getting up from her long illness through Mary’s intercession, and her last words “My God, I love You” — look like they were shot through a haze. There is also little focal depth to the film, so the film drowns in a sea of blurry mud. The shot of Mr. Martin taking Pauline to the Carmelites ends with a long shot of the family mansion — and you can’t even see the family’s faces. The acting is declamatory and stagy (if sometimes effective in that style), with everyone speaking in complete, literary sentences. The casting is off, because when Therese is about 12 or 13, she is being played by an actress who looks to be in her early 20s. The score is excessive and syrupy, and with very little variation (the same sugar is poured over the funeral of Therese’s mother, the one moment in Therese’s early life that has to have some harrowing quality). There is very little drama and even that’s fumbled away (the scene of Therese imploring the pope to join the Carmelites is twice telegraphed and flatly performed). The establishing shots of Rome are so obviously stock footage as to be almost parodic. And the direction is clumsy (Therese’s last look at her father is cut away from too quickly). In short, nothing in THERESE works. This will all seem like needless cavilling or obsession with cinematic form to some of my Catholic readers, who might have a special devotion to the Little Flower or been beneficiaries of her intercession. I would never denigrate such “real life” miracles or works. And I have no doubt that God can use a bad movie to work wonders in men’s souls, but that’s for Him to decide — and being God, He can use PLAN 9 FROM OUTER SPACE for such purposes if He so chooses. 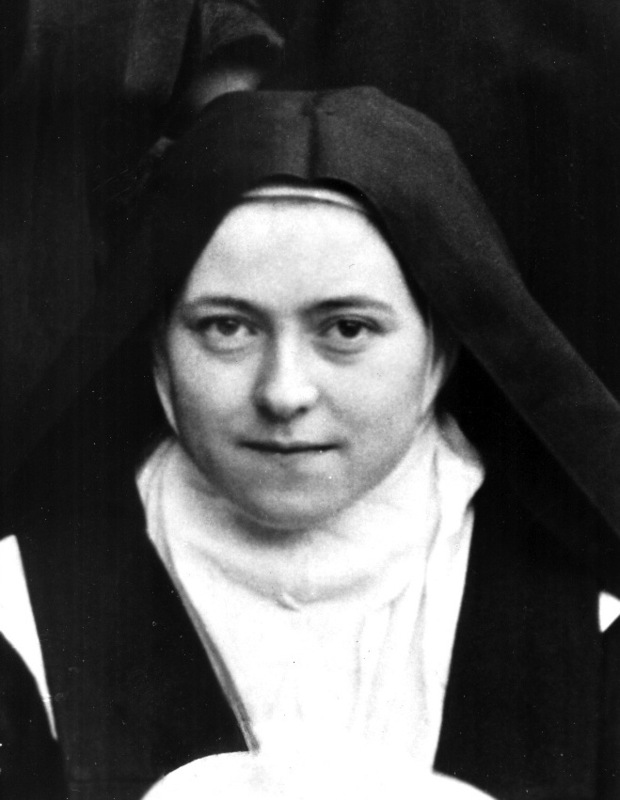 But until sainthood is imputed through the camera lens, all we lowly mortals can do is consider THERESE as a movie. I don’t want to go too deeply into the tiresome issue of the subjectivity of taste, but I think THERESE is a clear-cut case. Anybody who says this movie is good is not responding to the movie itself, but to its real-life story events (in which case actually viewing the film is superfluous, as is making it, come to think).